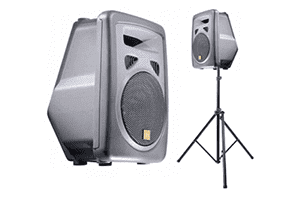 Mixer/Media console, 2 microphones, 2 15″ loudspeakers and 2 stands for events with activities occurring at the same venue as the primary reception but in a different or adjacent space. Ideal for wedding ceremonies, cocktail reception spaces and satellite rooms (some events may have dinner in one room and dancing in another - this system is perfect for those situations). 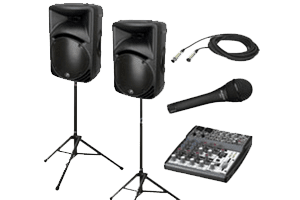 Media consoles, mixers, speakers, subwoofers, amplifiers, microphones and speaker stands for “do it yourself” audio needs. CD players, MIDI controllers and auxiliary (“headphone jack”) options available. Piano, Strings, Keyboard, Vocalists available.